Turning your trash into treasure is just the beginning. It’s all about Rethinking, Reusing and Recycling. We accept items that others normally wouldn’t, adding value and making them attractive or useful to someone else. Drop-off items must be suitable for resale or recycling except for white ware and electrical appliances which we will accept in any condition. Not only can you find a bargain, you can enjoy social interaction with other like-minded community members. We want to encourage community involvement by inviting people who develop and/or make items out of and from recycled goods to have stalls on-site from time to time as part of our community engagement. 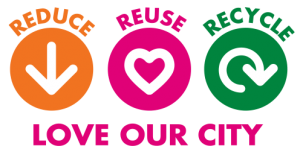 Our goal is to change behaviours, habits and culture of our community to be more focused on recycling. We are committed to reducing the volume of material going to the landfill. We are open Monday to Saturday from 8.30am till 5.00pm, and Sunday and Public Holidays from 9.00am till 5.00pm. Call us on 04 2376 760 if you have any queries. WE CAN ACCEPT: any furniture that is suitable for re-sale (no rips, tears or broken bits), beds, mattresses in good condition, toys that are re-useable, clothing , books, kitchenware, linen, pillows, cushions, couches, armchairs, prams, garden accessories, tools….and the list goes on. Please don’t be offended if your goods are rejected as we need to be able to find a market for anything that we accept. We have limited space which means that there will be times that we are overflowing with certain items, and may have to say no. WE CANNOT ACCEPT: any goods that we are unable to sell because they are regulated or require special Safety features that we cant provide e.g. baby car seats, baby capsules, booster seats, life jackets, bike helmets, food, alcohol, paint, chemicals. We are unable to recycle printers/copiers/scanners. There will be times that we are unable to accept certain goods because supply exceeds demands, and we have limited space. Everything is free to drop -off EXCEPT televisions and monitors. The following charges apply: $25.00 for CRT televisions and monitors, and $10.00 for flat screens. Trash Palace does have to pay for landfilling just like the general public, and for this reason we need to be careful about the items that we accept. We encourage the public to use the recycling bins across the road before landfilling. For a small fee we can deliver, or provide a free courtesy trailer to take home items purchased from Trash Palace. We offer barbecue facilities for schools and charity groups to use on-site for fund raising events. and learn more about recycling. Our vision is to make Trash Palace “the place to visit” when it comes to recycling, reusing, education and change. Visit us today – we would love to show you how we turn your trash into someone else’s treasure. and electrical appliances which we will accept in any condition.